Jack gazed longingly at the little jalapeno plants, 3 of them nestled together. I said, “I don’t think we can grow those, its not hot enough in the summer.” “Why don’t you try?”, he said. You see, Jack’s brother grows really hot chili peppers in his garden. Jack is in a competition with his brother. I’m not, but I have garden duty. My job is therefore to grow the chili peppers. I tried to grow habaneros a couple years ago, but I couldn’t even get them to sprout. I gave in. We carried the jalapeno and strawberry plants to the cash register. I planted a few strawberry plants in a multi hole topsy turvy grow bag a few weeks earlier and soon realized you need to fill most of the holes with plants for it to work properly. We carefully stuck 3 more strawberry plants and the 3 jalapeno plants into the excess holes. We watered frequently and the strawberries produced a few puny berries with a slightly chemical taste. Summer arrived and the jalapenos ate up the warmth. I noticed little buds and then tiny jalapenos developing. I ran in to tell Jack we gave birth to chili peppers. Jack asked me to wait till the little peppers darkened but I couldn’t wait to try them. I picked a few medium sized chilies and added one to our stew. Would they be hot? The jalapenos you get in the grocery store can be a real let down in the spicy department. No, the one wasn’t. How about 2 chilis with seeds? Jack and I like spicy so I don’t seed our chilies unless they’re habaneros. Yes, 2 of our jalapenos added to chicken enchiladas produced a slow even heat. The summer remains warm, upper 70’s and 80’s. 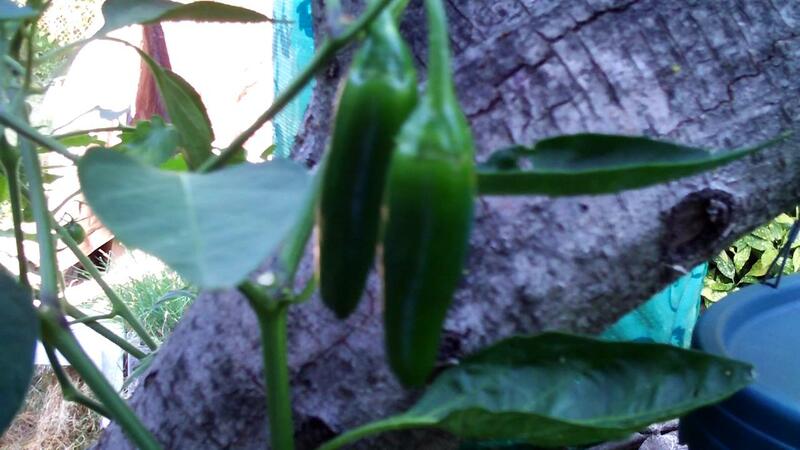 My jalapenos are producing a bumper crop. I picked 10 for my co-worker who likes to cook with chili’s. My co-workers marveled at my chilies and pronounced them perfect. I thanked them for their vote of confidence. Who knew I could grow perfect chilies, not me, that’s for sure. I noticed a recipe for tomato cobbler and I also grow tomatoes. Not as successfully as chilies. Plain old tomato cobbler is a bit too boring and I’ve got all these wonderful jalapenos. I added 4. My cobbler bit back and I liked it. If you want to make a cobbler with a kick, just add jalapenos to your favorite tomato cobbler recipe. Don’t be a wimp and seed your chilies either. Posted by kriskkaria on September 20, 2014 in Comedy, Humor and tagged comedy, doesthishappentoyou, funny stories, funnystories, jalapeno, spicy food. oh, this sounds great – ole! Its adds a nice kick to those plain old tomatoes. Hey, Kris, if it’s chili today, will it be hot tamale? Produce you can be sure of. Great to hear about your experiments, and success, with growing veggies. thanks, gardening is not easy.